The best zero turn mower for professional landscapers on a budget. If money were no object, you'd equip your lawn care business with an advanced, commercial-grade zero turn mower. If you're on a budget, you'll be glad to know you still can. The compact sized IS® 600Z will fit most garden sheds and trailers with room to spare, yet comes loaded with all the power and enhancements that make Ferris mowers an industry giant. That means you can perform any lawn project like an expert while saving time and money. How do we do it? Start with our signature full rear adjustable suspension system complemented by a shock-assisted, pivoting front axle. You'll feel the difference immediately, a surprisingly refined ride for a wide area mower, providing greater control to mow evenly over rough ground faster – with less scalping than a non-suspension mower. Traction is also improved for added stability riding up hills and around obstacles. On to our rock-steady deck options. 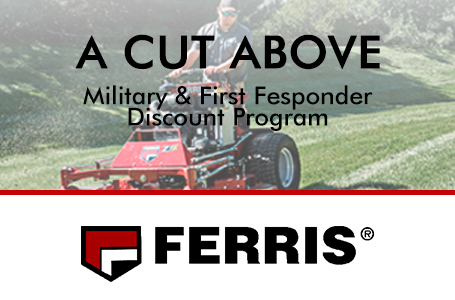 Under the 48" models, you'll find our signature iCD™ Cutting System, equipped with an included professional lawn striper for an expertly groomed finish every time. Our 44" models feature a 10-gauge fabricated cutting deck and can be outfitted with the lawn striper (sold separately for the 44" deck). Both decks have greaseable aluminum spindles for dependable service and long-lasting Marbain® steel blades for a consistently superior cut. Large-acreage homeowners, prepare to make your neighbors jealous. This spirited mid mount mower comes with your choice of powerful V-twins. Consider the American-made1, 25-gross-horsepower* Briggs & Stratton Commercial Turf Series™ motor. Or, choose the 18.5-gross- hp Kawasaki® FS600V. You can pair either power plant with a 44- or 48-inch cutting deck. Just like its big brother, the IS 700Z, this riding mower comes equipped with our dual commercial Hydro-Gear® ZT-3400® transaxles – one more feature raising the bar not only in quality, but also commercial readiness. When the badge reads Ferris on the outside, you can rest assured there's proven performance inside. Perhaps you thought owning a commercial-grade zero turn mower was a pipe dream. Now you know nothing stands in your way. We built the nimble IS 600Z to close the gap between what you can afford and what you truly want. Acres Per Hour - Mows up to 4 acres per hour, based on 80% efficiency. Cut Height - Foot-operated deck lift, with adjustable pedal, can change cut height in 1/4" increments from 1.5"- 4.5". Debris Management - Briggs & Stratton Commercial Turf Series™ engines are built with the ultimate in dust and particle filtration, an advanced debris management system and beefed-up cylinder block structure. Exceptional Performance - Patent-pending steering system delivers exceptionally smooth performance. Integrated Transmissions - Commercial Hydro-Gear® ZT-3400® transaxles are designed for high performance and are fully serviceable. Miles Per Hour - Ground speed is up to 10 mph (48") and 8 mph (44"), reverse 4 mph. Patented Suspension - Suspension system consists of rear coil-over-shocks with dual cast-iron maintenance-free suspension arms (shown) and front independent adjustable coil-over-shocks. Protection - Heavy-duty bumper protects the engine while also allowing for easy service access. Smooth Controls - Smooth, precision controls last longer as a result of pillow block bearings on control mounts. Spindles - Cast-aluminum greaseable spindles feature 1” shaft with 2.5” x 1” dual ball bearings with top access grease fittings and pressure relief valve. Fuel Capacity: (Total) 5.5 gal. Overall Width: deflector down / deflector up (model) 59" / 47"
Control: (Safety Group) Seat activated engine kill, clutch safety switch, neutral and parking brake safety circuit. 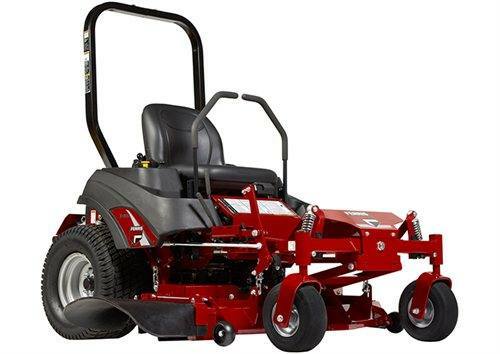 Mower Cutting Height: 1.5"- 4.5"
Warranty: Engine: 3-Year Limited Manufacturer's Warranty ; Balance of Machine: 4-Year Limited Warranty (48 months) or 500 hours, whichever occurs first. Unlimited hours during the first 2 years (24 months). Coil-over-shocks and all suspension related components are covered for 4 years (48 months) unlimited hours. Belts, Tires, Brake Pads, Battery, Blades: 90 days See Dealer for Warranty Details.